In another life books framed my days. I slept with them, dreamt about them, woke to their presence stacked by the bed and in various corners throughout the house, read them, handled them, discussed their merits with friends, co-workers, beer-drinking buddies, bartenders, customers, strangers, relatives, and even enemies. Traced my fingers slowly down their spines, identified some by odor alone, others by weight and feel. Bought, sold, cleaned, lent, skimmed, traded, gave, borrowed, collected, repaired, preserved, received. Traveled to acquire more, returned home to find still others languishing in never-opened, partially read or barely touched states. There were always too many. There were never enough. The relationship began innocently. I’ve been an avid reader since the age of five, and over the years developed a knack for uncovering uncommon modern first editions. I’d walk into a thrift shop and spot a copy of William Kennedy’s first novel, The Ink Truck, snuggling up to Jane Fonda’s workout book, for a buck. Or at a small town antique store, something especially nice, perhaps a near-fine first edition of Cormac McCarthy’s Outer Dark, would leer at me from a dark shelf – $1.50. John Berryman’s Poems (New Directions, 1942) found me at a garage sale, for a quarter. Good Will yielded Pynchon’s Gravity’s Rainbow. There were others, of course. Many others. I partnered with a few like-minded friends and opened a store, and when that didn’t work out, started my own home-based book business, which eventually expanded into a small brick-and-mortar shop, a true labor of love. And I mean labor. The forlorn space we rented was cheap and had housed for years a low-end, illicit massage parlor. Cleaning it out was, oh, shall we say interesting? I’ll never forget the furry massage table, the naked lady lamp or the various implements left behind after the joint was finally forced to close. But we hauled out the filthy carpeting, stripped and refinished the hardwood floors, fixed, painted and patched what we could, and hid what we couldn’t. It was exhausting, but well worth the toil. My work schedule ran from Monday through Sunday, a minimum of eighty hours a week – in a seven-year period, I took off only two long weekends. It consumed me, but in the end I emerged mostly intact, a little more aware of my proclivities, of an unhealthy tendency to immerse myself wholly into an enthusiasm, to the detriment of family and friends. When we sold our store’s wares, I embraced the change; some dreams simply deplete you. But the itch remained. Just a few weeks ago I found myself perusing an accumulation of books in a storage facility across the street from a junk shop in Llano, Texas, a small county seat an hour’s drive west of my home on the outskirts of Austin. 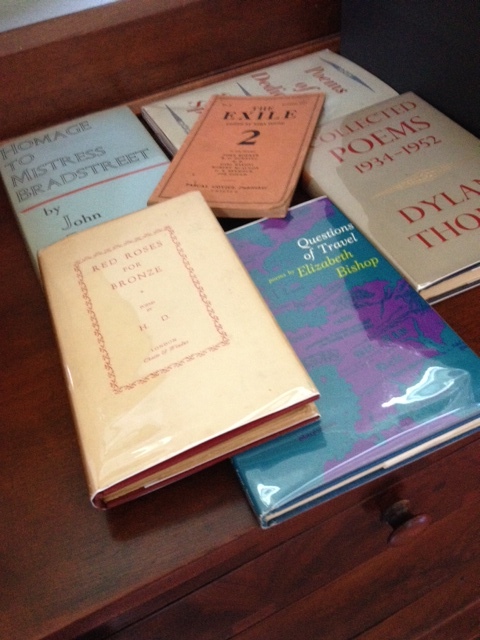 The shop’s owner had purchased an English professor’s estate, and judging by the collection, the professor had specialized in poetry. 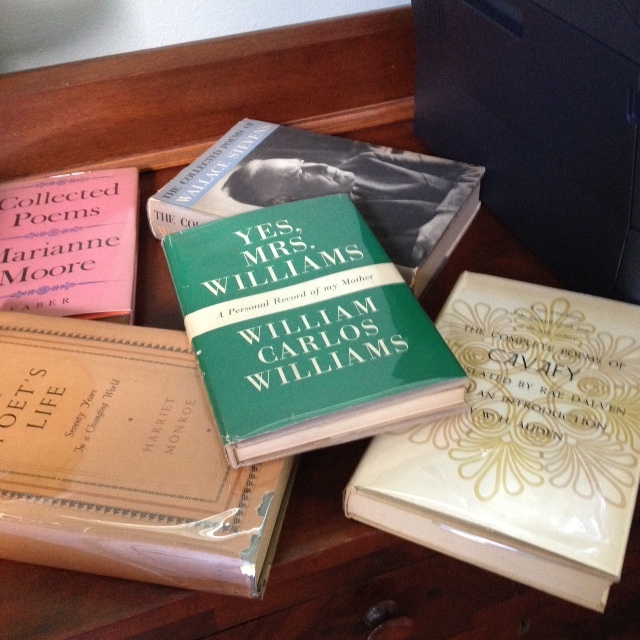 My first thought was “I want it all,” but reason set in (I could very well imagine my wife’s reaction were I to arrive home with a trailerful of books) so I glanced over the criticism, fiction, drama, essays and biographies, and concentrated on the poetry. In the end I walked away with thirty-one books, including H.D.’s Red Roses for Bronze (Chatto & Windus, 1931), Randall Jarrell’s Little Friend, Little Friend, Elizabeth Bishop’s Collected Poems and Questions of Travel, a brace of Berrymans – His Toy, His Dream, His Rest and Homage to Mistress Bradstreet – both the U.S. and U.K. first editions, which differ – and Love & Fame. A good haul, to say the least, but one that left me only partially satisfied and contemplating a return. But I remain resolute. So far. This entry was posted in books, Poetry and tagged books, collecting, creative writing, first editions, life, memoir, poetry, poets, rare books, reading, writing by robert okaji. Bookmark the permalink. An itch one cannot scratch away. I have a similar story – ended up with two book stores – definitely a labour of love, but alas, not profitable. Had to let go of most of my books when we sold our worldly goods in exchange for the nomadic life – but the itch, as you say, remains. There’s nothing like finding a trove of books in an unexpected place. Oh, the stories! I would not want to even guestimate how many of my books are yet to be read … they come in much faster than I read … and even with Amazon’s speedy deliveries, there’s a good chance something else has my attention before arrival. Curious which former bookstore was once yours? I try to purchase only poetry or poetry-related books these days, but of course that doesn’t work. People recommend novels or non-fiction, and I spot interesting titles here and there, and the next thing you know I have a dozen books to read. The store was called Asylum Books. Oh, what fun, what labor, what heartbreak. Asylum is an intriguing name for a book store! Sad story … but what an experience to compare everything else to. Ever have dreams set in the bookstore? Asylum, as in refuge, or as in other connotations. 🙂 I wouldn’t trade the experience for any other. We could have continued, but when someone offered to buy us out, we took the opportunity. It was time to grow, time to get a “real” job and live a life beyond the hand-to-mouth existence of a bookseller. I’ve had many dreams set in bookstores, but never my own. Funny how that is. Wow, what a cool find!!! Have you seen that cartoon of the guy who was killed by the books he accumulated on his bedside table falling over on him? That guy would be me, except my wife points out my precarious stacks, and I make them less so. Ha! It never does! The first rule of bookselling, especially in the used and rare business, is that you can’t keep the books. But truly, the joy was in never knowing what treasures people would bring in to sell, and then matching the treasure to the right buyer. I sold off most of my personal collection in those years, and have few regrets. The rarities were nice to own for a while, but I’m happy to have let them go. Oh, the books! There are worse obsessions than books! I think I’ve reached the point where books have ceased to be reading material and have become insulation. i miss books. When i get the chance i indulge, but there isn’t a bookshop on Jeju. That would be difficult to deal with. I can read prose on the Kindle, but not poetry. Just doesn’t work. i have books, but i come by them after long periods. What i tend to do is re-read stuff, just read stuff till the covers wear thin, which is handy actually; you really get to know a text. i’d maybe do that with a bookstore in town, but i’d also be very tempted to keep buying & skim reading. In my limit i found a useful approach. There’s nothing better than reading a book so deeply that you KNOW it. I tend to read quickly, but some books grab me and I return to them time and time again. The more I read them, the more I know and understand. These days I know so many people getting books published that I find it hard to keep up. I try to buy them all, but often find myself lagging behind in reading. But there are worse problems to have. I will never buy a kindle because i know i’ll hoard & not get round to reading 90% of the hoard. Better to buy when i can & really get to the crux of a text. Not a bad problem to be stuffed with a to-read list a mile long. Just hope no one pesters you for your opinion or you could land yourself in trouble. I use the Kindle for “disposable” fiction or for information – light research into an enthusiasm. But for in-depth reading, I still rely on paper. The bookman in me requires it. Thank you, Derrick. Books, books, books! Those who know and love me best give me books…most recently, Peter S. Beagle’s “In Calabria” and “The Overneath”, Fiona Stafford’s “The Long, Long Life of Trees”, and Reza Aslan’s “God: A Human History”. Yum! Even to this day I’m often mistaken for a bookstore employee. People ask me for directions or recommendations. Something in my demeanor, I guess.